Shakhrisabz "Green City" is one of the most ancient cities of Uzbekistan is located in Kashkadarya region, 80 km form Samarkand and 410 km from Tashkent. The city's population is 53 thousand people. Altitude above sea level is 622 meters. In ancient times the city was known as Kesh. The city was founded more than 2,700 years ago, its first inhabitants were the Sogdians, known for their handicrafts, trade and high culture. In 329 BC, after the city was captured by the troops of Alexander the Great, Kesh was under the influence of Hellenistic culture. Since that time there were popular ancient Greek cults and beliefs. The most famous were the cults of Heracles and Dionys and Athens. III century BC through VIII century AD, Kesh’s rulers produced a large number of coins. For some time Kesh was the capital of Sogdiana. In the VIII century the city was conquered by the Arabs. For a long time Shakhrisabz was the center of anti-Arab and anti-Islamic resistance. According to historical data, the last ruler of Shahrisabza was Bobo Beck. Shakhrisabz is the birthplace of the great Tamerlane (Timur). 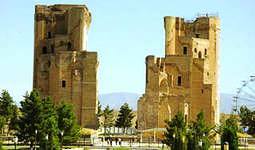 During his reign, there were erected many palaces, mosques, mausoleums, as well as majestic palace Ak-Saray. That time the city was not only trade and craft center, but also one of the cultural centers of the East. 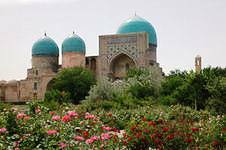 "Green City" Shakhrisyabz included in the list of World Heritage Sites. The historical city center is diverse, but the most popular architectural monuments of Shahrisabz are: Aksaray Palace, Kok Gumbaz Mosque (Blue Dome), Gumbazi Seyidan mausoleum (Seids Dome), memorial complex Dorut Tilavat including Sheikh Shamsad-Din Kulyal al-Keshi mausoleum (there also was buried Timur’s father Amir Turagay).